Due to size or weight considerations, certain items will be delivered by a Less-Than-Truckload (LTL) freight company. When this is ready to ship, our staff will contact you to clarify delivery specifics, dates and times, as well as shipping charges, which cannot be fully determined in advance. Any shipping charge shown for this item at the time your order is placed is only a deposit based on the value of the item. You will be refunded or charged for the difference between the deposit and actual shipping cost once it is determined. Leonardo stands nearly 5-feet tall! The katana-wielding leader of the Teenage Mutant Ninja Turtles. Hand-painted, authentically detailed, full-size statue. Protect your home from the nefarious Foot Clan! Protect any room from the nefarious Foot Clan with this incredible full-size replica of the katana-wielding leader of the Teenage Mutant Ninja Turtles. 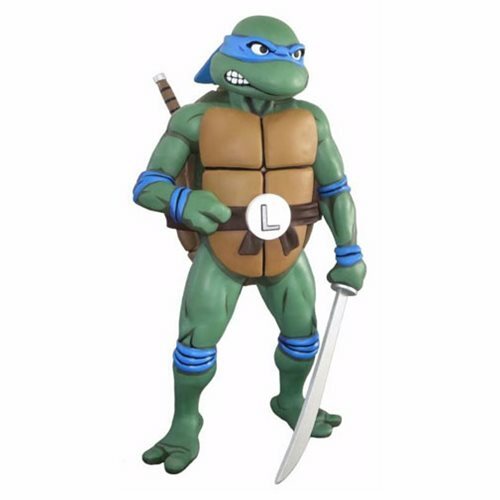 The Teenage Mutant Ninja Turtles Leonardo Life-Size Statue from NECA is based on the classic TV cartoon series and stands nearly 5-feet tall! Made of hand-painted foam rubber and latex, it's authentically detailed, right down to the katana holder on the back of his belt. Leo ships in two boxes and is very simple to assemble.